When kidneys can't filter properly, pets are at risk of low potasium. Managing potassium deficiency is an important step in maintaining your dog or cat's quality of life. 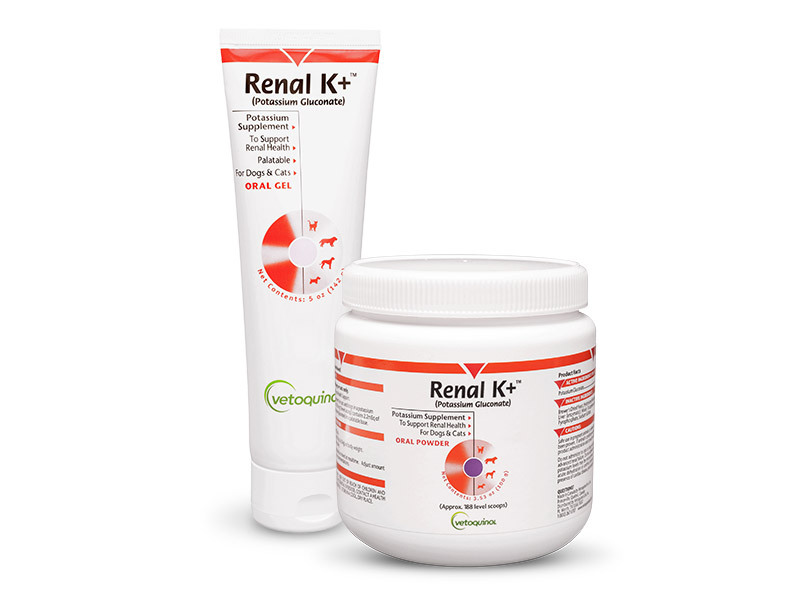 Renal K+ gel: Administer orally. For adult dogs and cats, give 1/2 tsp. per 10 lbs. (4.5 kg) body weight, twice daily. Adjust amount based on veterinary recommendations. Renal K+ powder: For adults dogs and cats, give 1 level scoop per 10 lbs. (4.5 kg) of body weight. Give orally twice daily. Powder also may be sprinkled or mixed at mealtime. Adjust amount based on veterinary recommendations. Each level scoop (530 mg) contains 2.2 mEq of potassium. Consult your veterinarian before giving your pet Renal K+. Follow the recommended administration on the package, unless otherwise instructed by your veterinarian.